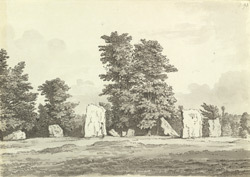 Located outside the village of Stanton Drew, near the River Chew, the extensive stone circles are some of the most important prehistoric monuments in Somerset. There are three circles here dating from the Bronze Age (2000-1600BC). The largest is 120 yards across and the stones stand an average of 6 feet high. There are other scattered stones near the circles suggesting that the circles were connected with stone avenues. There are many local traditions about the site. In 1664 John Aubrey visited here and was told that the stones were a petrified wedding party and he was shown the figures supposedly of the bride, the parson and cook!